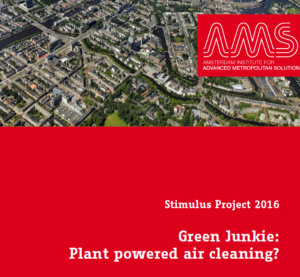 A new report presents the results of the Amsterdam AMS Stimulus Project ‘Green Junkie: Plant-powered air cleaning’. 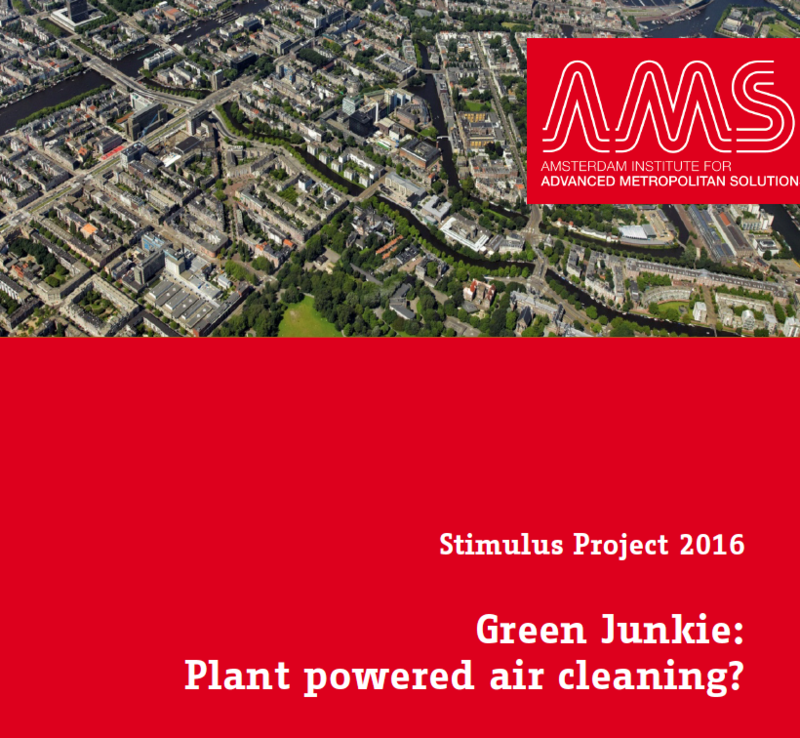 In this project, the authors tested the idea that a specially developed plant named Green Junkie could increase air quality along roads intensively used for car traffic. MyEarth had bred this variety of the Honeysuckle, with extra hairy and scaled leaves, and anticipated an extra reduction of particulate concentration in the air in comparison to other plants. Meeting the requirements of a Stimulus Projects – an innovative solution to an urban challenge in Amsterdam, with upscaling potential and involvement of stakeholders (MyEarth, Engineering Department Amsterdam, Urban Roofscapes) – the project was taken on to research the possibilities to reduce particulate concentration with plant-powered air cleaning like city trees. This topic – and its valuable potential outcome – received much media attention from the very start. The results of the study showed that the Green Junkie only reduced the amount of soot air pollution by appr. 1.5%. Therefore, the plant is not considered effective in significantly removing soot from traffic-related sources and thereby does not sufficiently contribute to improving the air quality along roads intensively used by car traffic. With the outcomes of the report, AMS Institute sees no justification for follow-up research and will – for the time being – not invest in plant-powered air cleaning. The AMS Stimulus Projects are meant to give support to innovative ideas that have a strong upscaling potential. The projects may quickly assess the feasibility of ideas, or seek for a completely new and promising avenue of innovation. Typically, Stimulus Projects are relatively small research projects that realize short-term output, which acts as a catalyst for a new solution direction, concept or approach. Stimulus projects aim at generating major follow-up research projects (or programmes). Amsterdam, as many other cities, suffers from high particulate concentrations which have a negative impact on the air quality and the health of citizens.